Centuries from Dylan Budge and George Munsey helped Scotland A to a emphatic 9-wicket win against a very strong Durham second XI, bolstered by the inclusion of seven first-team players mid-way through the contest. Budge top scored with 151 hitting 18 fours and 3 sixes, while Munsey (123) was equally as prolific striking just one boundary less. 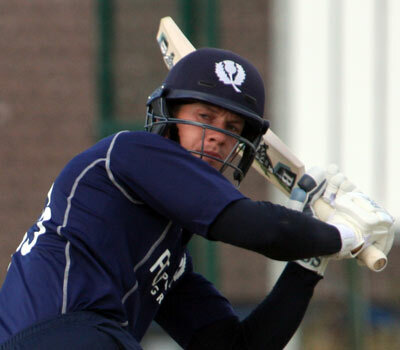 Chris Greaves (86) and Riyaad Henry (67) were also among the runs as Scotland piled on a huge 528 run total. That gave them a lead of 346 after they had bowled out Durham for 182 on the first day - Adrian Neill (3-14), Chris Robertson (3-43), and Hamza Tahir (2-29) doing the damage. It was Tahir who was to prove vital in the second innings as Durham proved more resolute in their batting. He took six wickets and Robertson a further two as the hosts posted 376 - Will Smith (136) and Irish international Stuart Poynter (61) adding 113 for the third wicket. Scotland duly completed a 9-wicket win which is a fantstic result for them and will give confidence ahead of the summer programme.